Consider multi-monitor configurations for commercial applications like digital signage, menus in large fast food chains and airport information displays, to large projection screens for theatres or large tradeshow/exhibition events, with active contents like 3D transitions, video and sound to present to the audiences. What are the current choices out there without costing companies a lot on power supplies, cooling requirements and warranty services? Basically none, but AMD tells us they have it today. 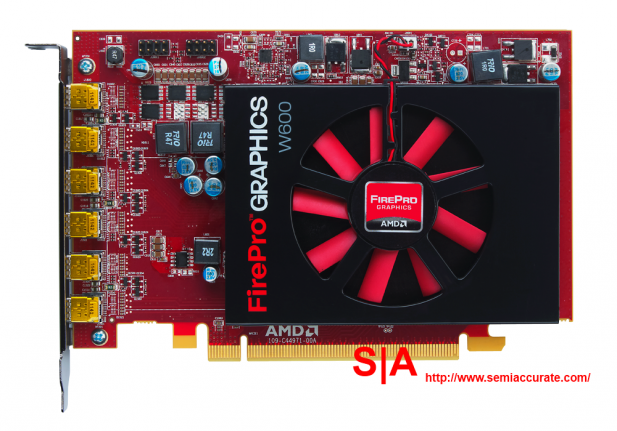 The FirePro W600 professional graphics is AMD’s latest professional graphics offering for digital signage and multi-monitor/projector, based on the latest 28 nm GCN architecture. The FirePro W600 professional graphics is equipped with a Cape Verde GPU, the card doesn’t require external power connectors, and a 350-Watt power supply is already enough. This card uses a PCI Express 3.0 x16 interface, but is perfectly backwards-compatible with PCI Express 2.1/2.0 and older interfaces, only that there would be some performance losses there. What this card, with a naming scheme as clear as mud to the general public with the only logical part being the prefix which is after the letter “V”, does is to allow a maximum of six displays going out from one graphics card, with six mini DisplayPort 1.2 and support for 4k displays (4096×2304 resolution) with 30-bit color depth at 60 Hz refresh rate for each output, this differs from consumer cards which only support 24 Hz (HDMI 1.4a) or 30 Hz (DisplayPort 1.2) refresh rates for 4k displays. If anyone wants more, two FirePro W600 cards can provide output up to 12 such monitors, which is also great for surveillance, security, control center, and operation center applications. The area where this card really shines is the support for projector overlapping, when one would use multiple projectors to create a large projection screen, overlapped areas will become a lot brighter. With projector overlap support, the overlapped area in pixels can be defined, and the graphics card driver will adjust the resolution to accommodate the overlapping area to create a seamless single large projection screen, similar to the bezel compensation feature on Eyefinity. One could only imagine what experience can six 4k projectors bring by making a stunning 53 megapixel projection screen (with 12288×4320 resolution). There are more features on refining multi-projector configurations like projection edge blending and image warping are planned in Q4 this year. The card also comes with a lot more goodies to offer, with 2 GB of GDDR5 graphics memory, digital discrete multi-point audio, AMD PowerTune technology and AMD ZeroCore Power technology to saves power under extreme load or complete idle conditions, the card supports DirectX 11.1 and OpenGL 4.2 APIs. All of the above comes in a single-slot full-height half-length form factor with an active fansink with vapor chamber. The card will come at a price tag of $599, and an active adaptor kit sold separately if six single-link DVI ports are required instead. The supported operating systems are the usual ones for AMD graphics cards: Windows Vista, Windows 7, and several Linux distributions, 32-bit or 64-bit version are supported. Just remember at least 512 MB of system memory is part of the system requirements, so AMD is basically promising painless upgrade for older systems with only PCI Express 2.0 x16 slots.